This new 48 Convertible is a handsome addition to the world famous Viking product line up with exciting styling, an impressive three stateroom layout with Viking’s legendary construction and attention to detail. Beginning with the same resin infused beamy hull as the new convertible, which carries its breadth farther aft for more interior volume, a wider cockpit, and more running surface, the Viking design group then turned to its pair of $1 million computer operated five-axis profiling milling machines and embarked on a prodigious course to create house and deck assemblies to produce the 48 Open, the 48 Sport Tower and the 48 Sport Coupe. In the process, Viking has once again rewritten the ground breaking rules of modern yacht design in creating fresh, contemporary models within a model. Whether moving up or moving down throughout the Viking fleet, you will find these new Viking 48 models true blue-water champions in spirit, performance, accommodations and evolutionary prowess in the herald Viking tradition. We invite you to contact your Viking dealer to learn more about these exciting new models. The 48 Open with its sleek sheer line, raked stem and razor sharp entry melds perfectly with the one-piece wrap-around fiberglass windshield to produce the epitome of an athletic and racy express cruiser. Outfitted with a fiberglass hardtop and a custom tuna tower and outriggers from our subsidiary Palm Beach Towers the result is a masterful tournament contender bound for the Winner’s Circle each time the lines go in the water. 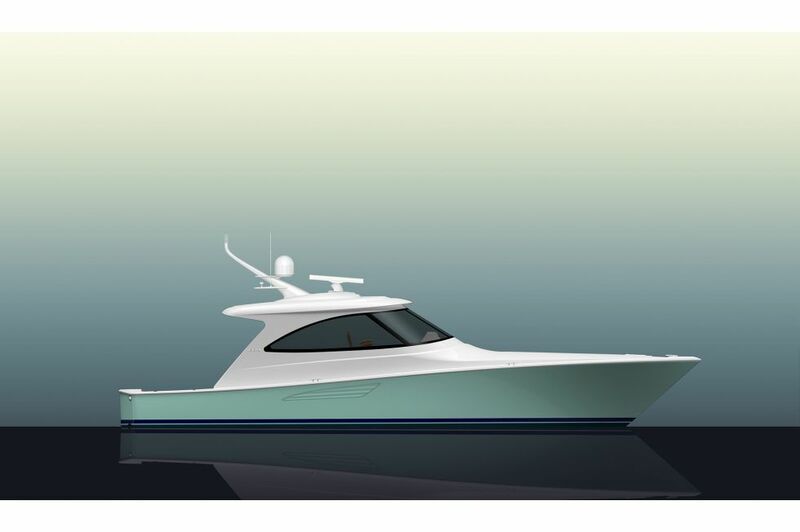 Completely unique and exciting profiles are offered with two other versions of the Viking 48 featuring a three-sided fiberglass, air conditioned deckhouse. Adding dashing definition and versatility this yacht can be further personalized with a Palm Beach Towers tuna tower for our Sport Tower version, or fitted with a radar arch or fiberglass mast for our savoir-faire Sport Coupe. 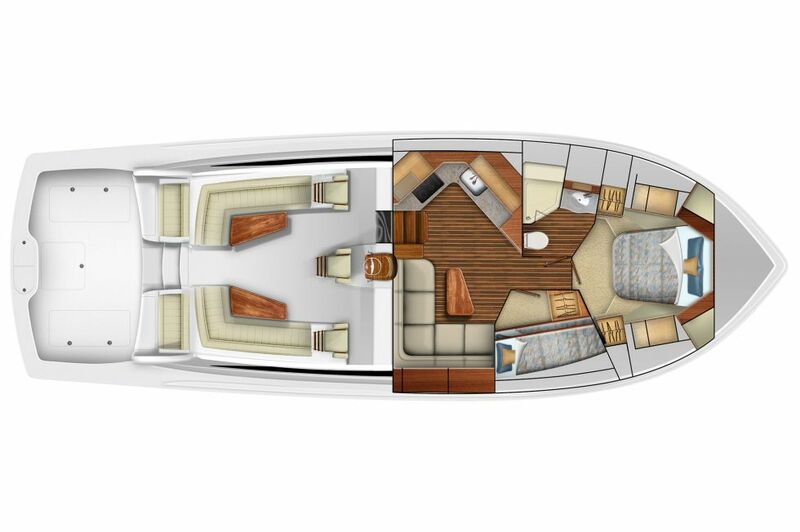 The Viking 48 Open, 48 Sport Tower and 48 Sport Coupe share a commonality of plush comfort and entertaining amenities. The 124 square-foot cockpit is ideal for fishing and other water activities. Stowage is ample throughout including a transom fish box, drink and bait coolers, recessed fish and stowage wells, and a split observation mezzanine. Space in the lazarette is provided for the available Seakeeper gyro stabilizer, which can be installed at the factory, or at a later date. Spacious and airy, the command deck has three pedestal seats, L-shape port and starboard molded fiberglass consoles with stowage and available refrigeration. Each console is complemented with a pedestal mounted table and generous seating. The centerline helm delivers excellent sightlines, power-assisted hydraulic steering, single lever electronic controls and sophisticated communication, entertainment and navigation electronic systems from Atlantic Marine Electronics to deliver each boat turnkey ready. The lush interior abounds with hand-finished teak joinery and spacious appointments throughout the salon including a flat screen television with surround sound. An L-shape lounge and dinette anchor the area for relaxing, dining and entertaining. To port, the galley is accented with Cambria treatments, under counter refrigeration, a microwave/convection oven and plenty of stowage. Inviting accommodations in two staterooms include a queen-size bed forward with private access to the head. A starboard stateroom has upper and lower berths. Powered with MAN diesels the 48 Convertible will cruise at 30 knots with a top end in the mid 30 knot range depending upon engine selection, load, sea and other environmental factors. The raked entry and forward chine are designed to pierce through head seas and divert spray downward. Convex hull sections add curvature and form to the running surface, while molded running strakes accentuate lateral tracking and maneuverability.